It’s New Year’s health resolutions time, again. The anxiety-inducing post-Christmas period has come around way too fast. One minute we were adjusting (read: undoing) our belts for another round of mince pies, the next, we’re making pledges to morph into a healthier, smarter, better version of ourselves overnight. But all these New Year’s health resolutions can be overwhelming. So how about making more long-term changes instead of focusing on gimmicky and unrealistic promises to yourself? This may be the way to cement real change in 2017. 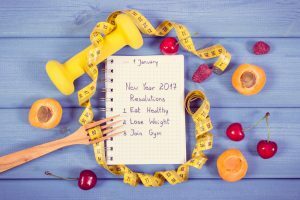 Research shows that we’re more likely to stick to our resolutions if they’re broken into bitesize goals that are specific, time-focused and measurable. A monetary incentive may also help us stick to our resolutions. Read our 10 New Year’s health resolutions – with tips on how to make them stick. We don’t need to tell you that cigarettes are bad for your health. In fact, as well as increasing your risk of having a stroke and developing respiratory diseases and cancers, smoking is an antisocial drain on your bank account too. There are many options available out there to help you give up the cigarettes, but if you’ve tried to go cold turkey in the past and failed, try reducing your daily smoking habit little by little this year.Alternatively, you could set what’s known as a ‘prevention goal’ which focuses on what you hope to prevent by sticking to your new resolution. “I have a responsibility to stay healthy for my family by quitting the cigarettes,” is an example of a good prevention goal that you can pin to your fridge for extra motivation! This is a broad resolution that many of us fail to stick to because of that very reason – it’s too broad. Remember what we said about making goals specific and time-based? For weight loss to be successful in the long-term, you’ll need to devise a step-by-step strategy on how you’re going to achieve it before you formulate new habits. Try joining a local slimming club where your aims are laid out for you each week, or, start by keeping a food diary to pinpoint what’s causing your excess weight gain. Alternatively, check the NHS website and our blog for realistic and healthy living tips. Again, for this resolution to work, you’re going to have to get number-orientated. Set a weekly running goal in minutes or miles, join your local sports club or sign up to a do-able number of classes in something that you know you’ll enjoy. You could also try pairing up with a friend who is also keen to do more exercise – that way you can motivate and encourage one another. The Department of Health and Human Services recommends at least 150 minutes of moderate exercise or 75 minutes of vigorous activity per week. If you suffer from consistent mood swings or a low mood, make some New Year’s health resolutions to address why this may be. Taking up meditation or breathing exercises is a great place to start. However, if you need to discuss your feelings, be sure to schedule an appointment with your GP or local mental health professional. This is another tricky resolution that covers a lot of ground, but if you tackle it successfully the long-term benefits for your health will be invaluable. The NHS recommends that men and women drink no more than 14 units of alcohol per week regularly. Give the usual methods, like cutting back gradually or keeping an alcohol diary, a greater chance of success by adding a monetary element too. Use this method to help you cut back on the booze – perhaps asking a friend or family member to ‘compete’ against you for a cash prize. There’s a lot of research to suggest that maintaining a close circle of friends can help us to live a longer and happier life, so make 2017 the year you get out there and reconnect with long lost buddies or loved ones. Make time to schedule weekly or monthly meet-ups in your social calendar or start small with texts and Facebook messages to those you would like to see more often. If you’re looking for new hobbies in 2017, be sure to pick just one or two and really devote some time to practicing them. If you lose motivation easily, try keeping a log of your progress – whether that’s writing down how many lengths you swim at the pool each week, or analysing your artwork after class. Why? The more you monitor your progress, the more likely you are to stick to your new habit. Studies show that on average, Brits consume a whopping 700g of sugar a week, so this is one New Year’s health resolution that we could all benefit from adhering to. In fact, you should be consuming less than 30g of free sugars a day. To help you stick to your reduction plan, first address exactly how much sugar you’re eating and drinking by looking at food labels and remember; sugar comes in lots of different guises (glucose, corn starch, fructose etc.). If you feel as if your family life has suffered as a result of work commitments or other things, start 2017 off by penciling in shared activities with your kids at the same point each week. New habits are created with consistency, discipline and forward planning. Lloyds Pharmacy Online Doctor offers a number of options to help kick-start a healthier you. Visit us online for a stop smoking online assessment or a weight loss consultation. Also be sure to check back on our blog regularly for additional healthy living tips.